Settle yourself into one of the inviting booths, order a glass of something refreshing and peruse the hearty menu which features all-American classic dishes fused with a taste of traditional Italian cuisine. You can even dine for less when you treat the family to dinner using Frankie and Bennys vouchers! Frankie Giuliani emigrated from Italy to the USA with his parents in the 1920s landing at Ellis Island, New York. They made a home for themselves in 'Little Italy'—an Italian neighbourhood district—and opened a restaurant within a year. When his father retired, Frankie took over the business with his best friend Benny, and it was their home-style cooking that formed the foundations of what has since become the successful transatlantic restaurant chain Frankie and Bennys. Priding themselves on excellent service, tasty dishes and a home-from-home atmosphere, Frankie and Bennys is the ideal place to spend a night out with friends and family, or a warm and welcoming spot to tuck into a delicious plate of pasta after a long week at work. Their cosy atmosphere and classic dishes mean that there's something for everyone, especially little ones—who are more than welcome to dine at any of their 210 restaurants nationwide. Make a saving on your order when you redeem Frankie and Bennys vouchers with your bill. It’s quick and easy to pick up the latest Frankie and Bennys voucher for free from our website, just remember to collect before you dine! Frankie and Bennys welcomes large groups and their friendly staff are on hand to help you make your night as special as can be! Before you set off for a fun evening together, click on our website to pick up one of our free Frankie and Bennys offers and make sure you remember to take it with you to the restaurant. On arrival, let your server know that you’ll be paying in part with a voucher code, so that they can note it down on your tab. Then settle yourself in for a lovely evening. Choose from their extensive menu featuring all kinds of tasty classic dishes with a signature Frankie and Bennys twist. When you are ready to pay for your meal, simply present any Frankie and Bennys discount vouchers you’ve brought with you to your server, and they will be able to deduct the discount from your final bill before they bring it to your table. You may need to fill in your address and personal information for them. Check that the amount is correct and pay your bill. What a fabulous night out together at Frankie and Bennys—made all the more enjoyable with that additional saving too! Treat the family to dinner away from the TV set this weekend and share stories over a wholesome feast. You won’t need to break the bank to afford a slap-up meal either, just you dine with a Frankie and Bennys discount voucher at your local branch! With great meal deals across their whole menu, you can explore their menu range for yourself by visiting Frankie and Bennys online today! You’ll even be able to add an extra large dessert to your main course of choice when you dine using free Frankie and Bennys discount vouchers from our website! Browsing Food & Drinks category takes a lot of time? Well, that is not surprising. Online shopping at Ask Italian, Bella Italia, Harvester and Prezzo can be a lot of fun thanks to valid coupons and voucher codes. If you’d like to check out the menu options before you arrive at the restaurant you can take a look on their website, or you can even download a pdf version to print out beforehand. Give your local branch a call and book a table to make sure you have a reservation for the evening. When you arrive at the restaurant, one of the Frankie and Bennys friendly team will guide you to your table and present you with your menus. If you have special dietary requirements, or children dining with you, just ask your server about the options available and they will be happy to point you to the relevant part of the menu. Order your drinks and meals and dine in the warm and cosy atmosphere. When are you finished and are ready to pay, alert your server and they will bring you your bill. Inform your server that you have picked up one of our free Frankie and Bennys discount vouchers and that you would like to redeem it. You can either present the voucher code as a print out or via your smartphone or tablet device. Your server will take the Frankie and Bennys discount voucher then apply it to your bill. The discount will be automatically applied and your total price updated. Once you’ve checked over your bill to see that everything’s in order, pay for the balance on your bill and complete your personal details if required. If you’ve had a great night and made a saving too, don’t forget to leave a tip! Simply let the menu do the rest of the talking by having a look on their website for the full list of delicious dishes. From beefy grilled burgers to homemade pasta bakes you’ll be spoilt for choice when you dine with your free Frankie and Bennys voucher next time you visit their restaurant! Making sure their customers go home with a great memory of eating out at Frankie and Bennys is very important to them, so they are always happy to hear from you about any feedback you may have. If you would like to find out about their menus, allergy information or special assistance at any of their restaurants, you can get in touch with the friendly Frankie and Bennys Customer Support Team who will be more than happy to help out with any questions you may have. Don’t forget you can also call your local branch direct using the restaurant finder tool, where they will also be able to give you more specific information if need be. 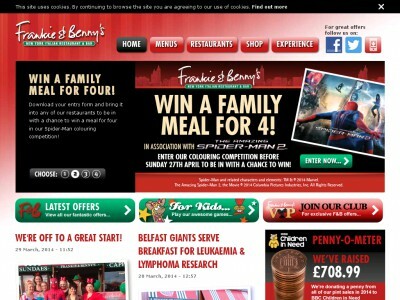 You can reach the Frankie and Bennys head office with general enquiries on their website. Be sure to keep them in your newsfeed, and share the latest updates with friends as soon as the new Frankie and Bennys discount voucher becomes available! Buy now online at www.frankieandbennys.com. Anyone in the UK who likes great food has probably visited Frankieandbennys.com at some point, as they are known for having good food at good prices. But did you know you could use Frankie and Bennys vouchers to make those prices even better? A Frankie and Bennys voucher ensures an even better price the next time you’re craving something tasty, and allow you to experience all the great food that Frankie and Bennys offers for even less. So grab your free Frankie and Bennys vouchers, and enjoy your meal and the discount!